Exploring a new city can be a daunting task if you only have one day to visit. It is best to visit with a local if that is an option. But, if not, there is plenty you can see and do yourself, especially if you are looking to get that postcard shot. Besides, touring by yourself has its own appeal and grants you a freedom unlike many others. There is something about looking back on a picture and saying, "I took that," or "I really was there," even if it may feel like a dream. And I, like most people, find it equally as fun to share the experience with those not fortunate enough to travel. 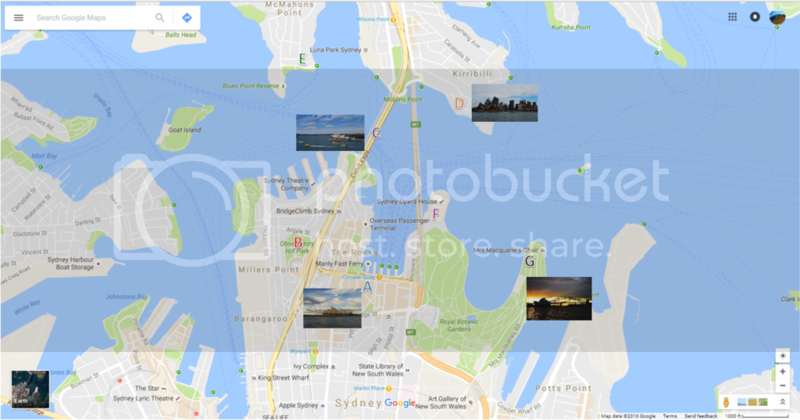 I have assembled a list of the best views in the city of Sydney, Australia and mapped them out as well. This list was compiled through hours of research while I scouted out the city and waited patiently for that right shot. Some of the best shots are worth walking that extra mile (or two) to get to just the right location. Depending on where you arrive in the city, will determine the route you will take. I have outlined one of the better walking routes since you will most likely come into the Circle Quay station in the heart of Sydney. The letters are color coded with the location on the map. 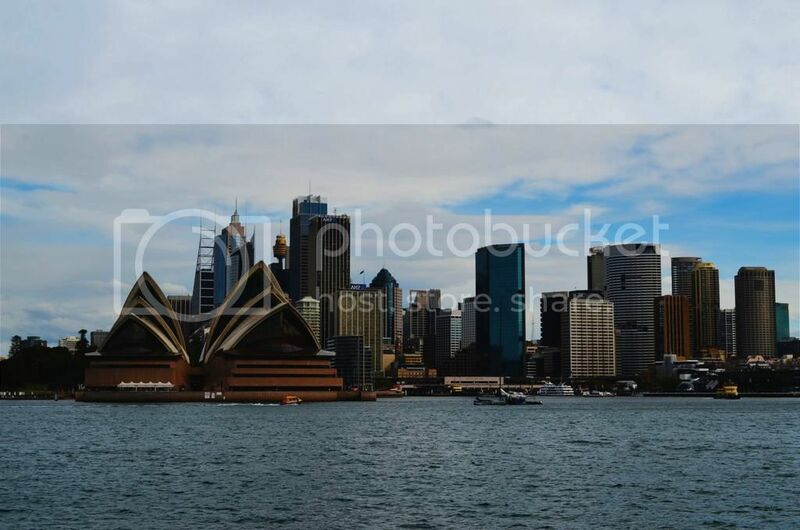 Circular Quay is a major transport hub in the city and is centrally located. As you step out of the hub you will see the skyscrapers in front of you, the Harbour Bridge to your right and the infamous Opera House on the left. It is very tempting to go to the Opera House here first but it is best to wait. If you arrive early enough, you can even catch the sun rising behind it from the park or bridge. Near Circular Quay there is the Museum of Contemporary Art and has some very cool exhibits and pieces itself. I only spent about an hour in this gorgeous building since it was a beautiful spring day with the sun out and clouds spread out in the sky. It is also a good place to hang out if you need to get in touch with someone through the wifi. 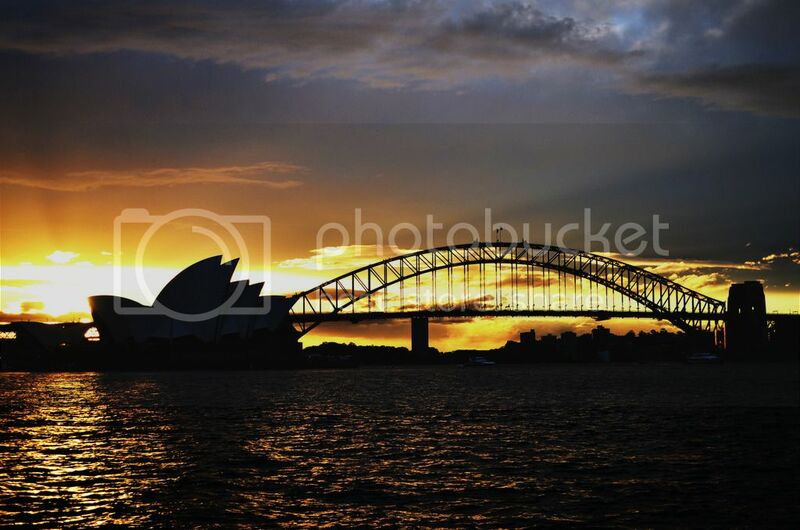 It is a stunning area in any regard and has a superb view of the Opera House. The park is named aptly as there is an observatory on it. 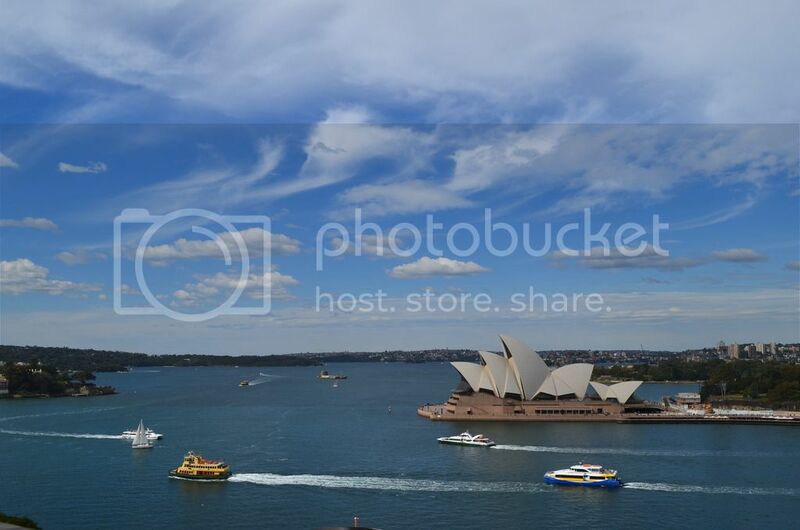 Also, it is a fantastic place to view the city from above - all of it except in the direction of the Opera House. But, have no fear, the other locations center around that. The massive fig trees provide excellent shelter for a picnic or just to get off your feet for a quick rest and the million dollar view sure helps! Make that hike, whether it be in the morning or to take in the sunset, it is well worth it. If you have the time, check out the observatory as well. This elevated position above the bay is one of the best views I found in the city. It was completely worth the few bucks to go up to the top but if you are on a budget, the view from the bridge is nearly as good. It is also possible to do a "bridge climb" where you walk up the truss of the bridge to the top. While this may be a neat experience, I am not sure the views would be that much better and it costs somewhere upwards of $160-380 depending on what time and how long you go. As you can tell by those prices, Sydney and Australia in general are not cheap at all, but it is a beautiful and clean city. I like to compare it to Boston in terms of its allure. Kirribilli Point is the southernmost point on the peninsula near the D on the map. To be honest, the whole peninsulas has great views of the city and it is worth walking around that area. Your photographic eye will point you in the right direction. 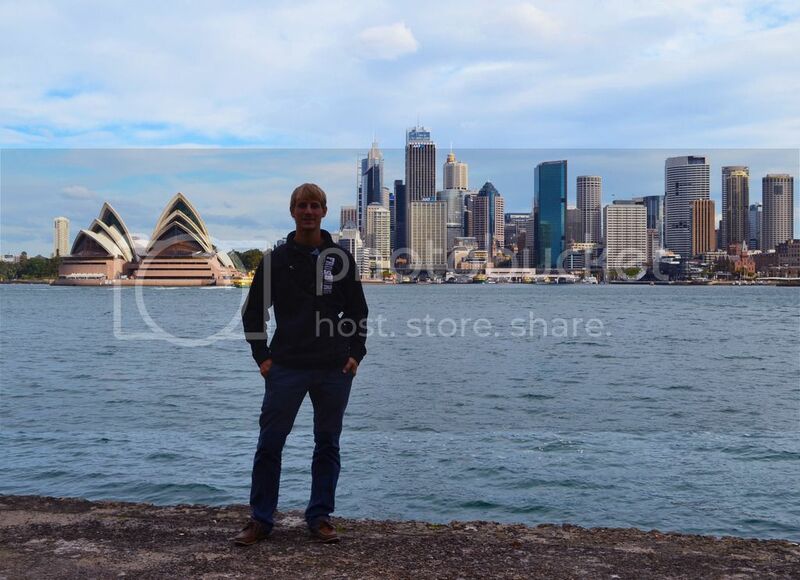 At the point, you have the historic Kirribilli House, which is the official house of the Prime Minister of Australia. The whole shore is peaceful and a nice walk in general; it provides a unique look at the city. I was lucky enough to run into a student who was studying in the area that also happened to be a photographer to snap some pictures of me (one of the troubles of traveling alone, unless you resort to a selfie). Mcmahons Point is on the back side of the bridge with the Opera House behind it. It provides a unique perspective of the city but I am not sure the walk would be worth it - take the ferry! There are many parks in the area so you cannot go wrong with strolling around this beautiful area. I was not able to make it their myself, but my friends from Sydney say it is worth the trip. The jewel of the city. The Opera House was opened in 1973 and is one of the most renowned buildings in the 20th century. Its unique shape and location draws the eye of millions of people, locals and visitors alike. This place is a must see, and you can even go in it if you do not have a ticket to a show. The lobby and shop are free to visit but I am sure they offer tours as well. The reason to save this for the latter part of the day is because the best sunset in the city is on the easy of it and you walk past the Royal Botanic Gardens. Plus, the build up makes it all the better. The park is magnificent! As you walk from the Opera House to the Farm Cove, make sure to check it out and get lost for a little. There are many flowers and animals throughout the park and also some old estate and government buildings Make sure to leave some time to spare so you can still make it to the last place before sunset. The Farm Cove is the place to be when the sun goes down. Although, you can argue a few other (but farther walks) may offer equally as nice views this one is easily accessible. 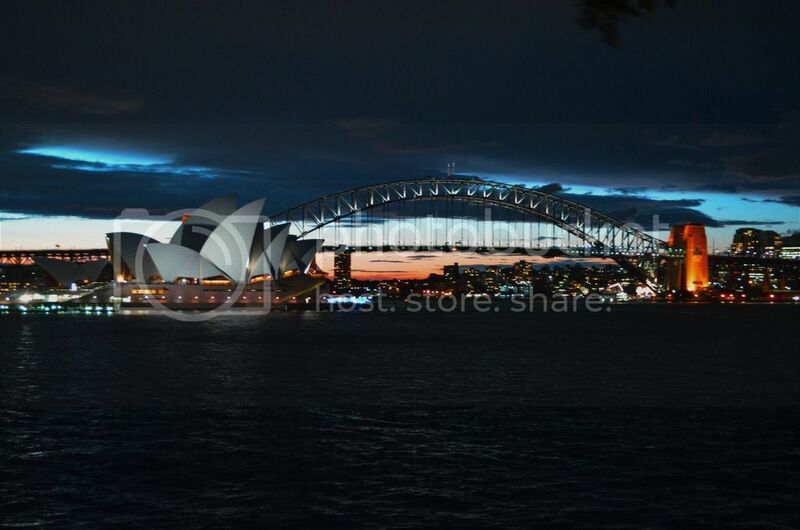 It is part of the gardens with the Opera House in front and the Sydney Harbour bridge and skyline directly behind. You cannot find a better place to shoot a sunset. The sun in August, sets almost directly behind the Opera House (depending where you your shot from) and lines up nicely. I will always remember this amazing sunset. Do not miss it!! 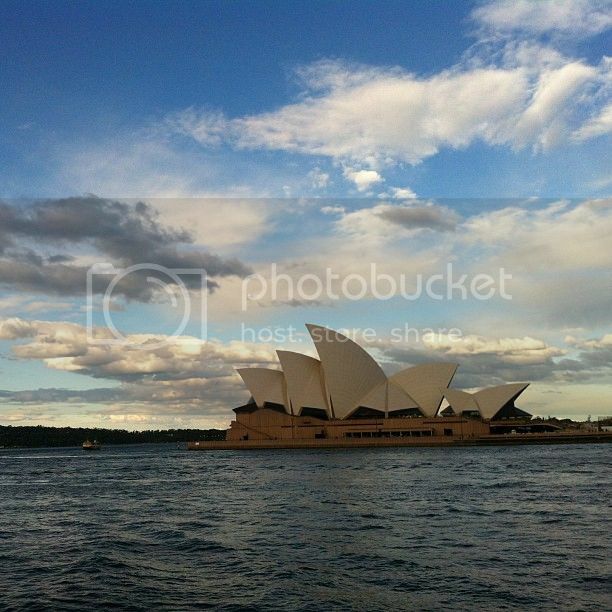 Even if you are walking on the waters edge from the Opera House, it is a great view and very peaceful. Unfortunately, I lost 90% of my pictures from this trip so I will leave a few areas for you to see for yourself. Safe travels and enjoy the great city of Sydney! Total Time & Distance walking: 2 hours 45 mins & 12.35 km (7.66 miles). I would highly recommend the ferry from Mcmahons to the Opera House to save your feet and time.